We except payment through paypal, echeques and postal orders and you can now pay with credit/debit card. 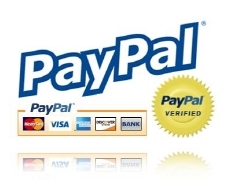 just checkout and follow the instructions through Paypal guest. It is important to us that our customers feel safe when shopping and buying from our site and that your order and money is protected through, it is also important to us that our customers trust us and will return or like us on our facebook store. Don't have a paypal account. NO PROBLEM just click on our checkout, Then check out with Paypal. Once you done that, click don't have a Paypal account and fill in the credit/debit card details.